Sherry Heishman, Agricultural Education teacher and FFA Advisor at Central High School, is proud to announce that Central’s FFA Livestock Judging Team finished in first place at the Big E, earning them the National Big E Championship. Central’s Livestock Team members were John-Robert Helsley (2nd), Jenna Kibler (3rd), Jacob Coffey (5th), and Gracie Bailey (8th). Team members’ individual placements are within parentheses following their names. The Big E is a big event! 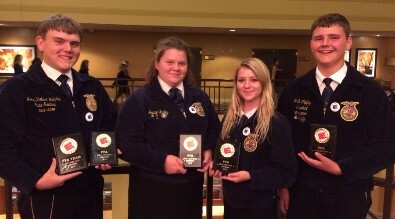 FFA teams who place first at state FFA Conventions advance to the National FFA Convention. Those teams who place second at their respective state conventions are invited to compete at the Big E, the Eastern States Exposition held annually in September/October in Springfield, Massachusetts. At the Big E, over 900 students compete in two days of events that mirror FFA events. The Livestock Team judged live animals—beef, sheep, and swine for market and for breeding-- and were required to defend their placements before a judge with 3 sets of orals reasons. Students also had to respond to a panel of industry experts about a livestock production scenario presented to their team.